A classic moving on End2End tour that uses rural roads to cycle from the English Channel to the Mediterranean Sea passing chateaux, interesting medieval towns, regional and national parks. France offers varied scenery with the route passing through the gently rolling pastureland of Normandy and The Loire in the north, the hills of the ancient Massif Central and finally the spectacularly wild limestone plateau and gorges of the Languedoc in the south. Moving on each day, sightseeing from the saddle, with some short days that give time to explore in more detail. Afternoon crossing on Brittany Ferries from Portsmouth to Caen, departing approx 1445 and arriving at 2130. 500m cycle ride to hotel. Stay 1 night. Cycle to Falaise through rolling Normandy countryside (68km). Stay 1 night. Cycle across Normandy to Mêle-sur-Sarthe (73km). Stay 1 night. Cycle to La Chatre, situated on the river Loir, (101km). Stay 1 night. 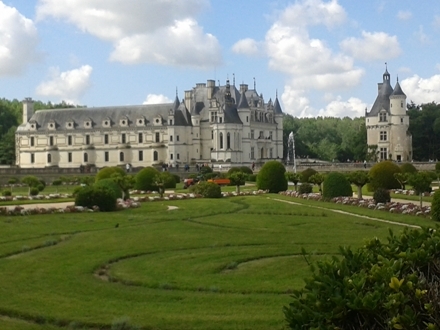 Cycle to Loches via Amboise (104km). Stay 1 night. Cycle to Argenton-sur-Creuse through the Brenne Regional Park (85km). Stay 1 night. Cycle to Peyrat-le-Chateau through increasingly rolling countryside (110km). Stay 1 night. Cycle to Mauriac in the Cantal department of the Auvergne (105km). Stay 2 nights. Rest day. Cycling options include possible ascent of Puy Mary. Cycle to Lacapelle-Viescamp via the medieval town of Laroquebrou and Lac St Etienne (60km). Stay 1 night. Cycle to Estaing with its 15th century château, via the Lot Gorges (88km). Stay 1 night. Cycle to Meyruis via the spectacular Tarn/Jonte confluence and Jonte Gorges (101km). Stay 1 night. Cycle to Le Vigan through the Cévennes National Park, via Mont Aigoual and the Atlantic/Mediterranean watershed (64km). Stay 1 night. Cycle to Aniane via the Cirque de Navacelles (69km). Stay 1 night. Cycle to the European Bike Express pick-up point at Montpellier departing approx 2000 for the return overnight journey to Calais. (65km). Morning crossing to Dover then continue to your chosen European Bike Express set-down point in the UK. Accommodation will be in 2 and 3-star hotels in rooms based on two people sharing. Half-board with the possibility of vegetarian meals if indicated when booking. No vehicle support is provided. Participants are expected to carry their own luggage. EU citizens must hold a passport that is still valid on the date of their return to their home country. Holders of non-EU passports are advised to check whether they require a visa. There are no compulsory health related requirements for UK residents, but you are strongly advised to check that your tetanus protection has not expired. You must also carry your European Health Insurance Card. Our Booking Conditions stipulate that, for holidays outside the UK, travel Insurance is mandatory. Details of the level of cover needed and other conditions you should check are stated in the Booking Conditions. CTC Cycling Holidays & Tours Ltd cannot accept responsibility for any costs that may be incurred due to insufficient insurance cover. The price of £1,770 is based on a minimum number of 10 people taking part in the holiday and is calculated at a rate of 1.12 euros to £1 sterling (based on exchange rates published on www.x-rates.com on 14 September 2018; pleaese note Booking Conditions, clause 3). If there are insufficient bookings by 16th March 2019, we will contact you and return all monies paid, although in certain circumstances the holiday may still run at below minimum numbers but at the same price. A deposit of £400 per person is payable upon booking, with the final balance of £1,370 per person to be paid ten weeks prior to departure, by 16th March 2019. This tour traverses France from north to south using rural lanes almost entirely, visiting villages and small towns chosen to be off the beaten track, and incorporating some interesting sites to visit. The countryside varies from flat to rolling, becoming increasingly hilly in the second half of the tour. Road surfaces are generally good. Most of each day will be spent cycling and sightseeing from the saddle. We will lead a group at a pace to suit participants, but you are welcome to ride separately at your own pace, meeting up at pre-arranged points along the day’s route. There is one rest day. It is important that you are fit enough to undertake each day’s ride as there will be no support vehicle. A more detailed itinerary, with sketch maps and GPS tracks of each day, will be sent with the final tour information. Participants will be sharing rooms. Some single rooms may be available for a supplement. Half-board has been booked at all the hotels (other than the first night), and vegetarian meals (if pre-booked) will be available. Breakfasts are continental style; a few offer only the minimum of fruit juice, bread and jams and hot drinks, but many also supply some or all of: cereals, yogurt, cheese, ham, eggs and fresh fruit. Supplies can be bought in the morning before setting off for lunch if you want to picnic but where possible we will try to stop near a bar-café. Where possible we will try to have mid-morning and mid-afternoon café stops. Outward travel will be via Brittany Ferries from Portsmouth to Caen, travelling during the day. Return travel will be via European Bike Express (Bike Bus), a luxury air-conditioned club class coach, travelling from Montpellier to your chosen drop off point in the UK. Cycles travel in custom-built trailers offering maximum security. The bus offers food and beverages for purchase. When booking this holiday online it is also necessary to complete a booking form for the European Bike Express and to email this to the Tour Manager. The form can be downloaded here. The maximum number of participants will be 16 excluding the Tour Manager(s). Initially the weather should be similar to early summer in southern England, becoming progressively warmer, especially after crossing the Loire. Southern France at this time should feel like a good British summer. You should carry lightweight spring clothing, with some extra layers should the weather turn cool, a change for evenings and a waterproof. However, the weather can be cold and wet, so make sure your extra layers are adequate. For riding at night or in poor light, a reflective yellow gilet is required. A road or touring cycle or a hybrid would be suitable and must be in good working order, especially the brakes. A bottom gear of 27 inches or lower (eg a small chainring approximately the same size or smaller than the largest cog on your rear wheel) is recommended. If unsure about gears, please discuss with the Tour Manager. Mudguards are optional, though you should consider bringing a small front light and flashing rear LED light in case of poor weather conditions or unexpected evening riding. Each participant is expected to carry spares and tools and be able to deal with punctures and minor repairs. Garmin GPS is recommended; if you need any help with choice of mapping please feel free to contact the Tour Manager. You could also carry maps: Michelin maps nos 303, 310, 317, 323, 325, 329, 330 and 339 at 1:150 000 (or 1:175 000) scale, or the relevant pages cut from a Michelin Atlas. Four Michelin Green Guides – Normandy, Châteaux of the Loire, Dordogne Berry Limousin, and Languedoc Roussillon Tarn Gorges – provide excellent background, but it is not recommended that you carry them on tour. In addition to travel insurance, EU nationals should carry a European Health Insurance Card, obtainable from www.nhs.uk/NHSEngland/Healthcareabroad/EHIC/. This enables you to take advantage of emergency medical services free or at a discount under a reciprocal provision that exists between EU member states. Your travel insurer may refuse to meet the extra costs of medical treatment if you do not carry this card. Before booking you should check the latest travel advice from the Foreign & Commonwealth Office including security and local laws, plus passport and visa information, at www.gov.uk/foreign-travel-advice or on 0845 850 2829.